Grown commercially throughout the United States, cabbage is a vegetable widely used for culinary purposes, but it also possess valuable medicinal properties. Traditionally used by the ancient Chinese for medicinal means, cabbage has swept its way around the world and into the homes of many for all occasions, from St. Patrick's Day to daily consumption. Its long list of vitamins and minerals continually benefits those who eat it, but there is much more to know about this European-native superfood. Supporting immunity. Cabbage is rich in phenolic compounds, which have powerful antioxidant actions and assist in strengthening the immune system. Fighting inflammation and ulcers. The presence of a high amount of antioxidants allows cabbage to fight external and internal inflammation in the body. Enhancing ocular health. Cabbage's beta-carotene levels help in the prevention of macular degeneration and, thus, assist in keeping cataracts away. Helping against degenerative diseases. Sulfur-containing chemicals within cruciferous vegetables, such as cabbage, are believed to play a role in the prevention of a number of degenerative diseases. While all types of cabbages provide health benefits, red cabbage contains higher levels of phenolic compounds, including anthocyanins, which give this vegetable its color, as well as its antiviral and anti-inflammatory properties. These phytochemicals have the ability to boost the production of cytokines, a type of protein that is released to fight pain and inflammation; it targets specific antigens, generating a protective immune response. Like all cruciferous vegetables, cabbages contain a group of sulfuric compounds called glucosinolates. During food preparation, chewing, and digestion, these phytochemicals are converted into biologically-active compounds, including dietary indoles and isothiocyanates, which are thought to help inhibit the development of degenerative diseases by controlling cellular overgrowth, as well as protecting the body against genotoxic agents. ALTHOUGH GREEN CABBAGE IS MORE COMMONLY EATEN, RED CABBAGE contains higher levels of polyphenols, which protect the body by fighting the free radicals that cause inflammation. Echinacea and tea plant also have strong immunoprotective properties, and similar anti-inflammatory benefits can be found in herbs like cherry and pumpkin. Cabbage contains high quantities of the complex carbohydrate raffinose, which is indigestible and causes flatulence while passing through the large intestine. Cabbage can also cause abdominal discomfort and bloating because of its high insoluble fiber content. Exceeding one's recommended daily amount of fiber may result in diarrhea. Those with cardiovascular conditions who are taking blood-thinning medications - or anticoagulants - to lower their risk of blood clots forming should be aware that foods high in vitamin K, such as cabbage, can reduce the effects of the medicine. Cancer patients undergoing chemotherapy should also be wary of over consuming cabbage, as it can worsen the diarrhea caused by this treatment. 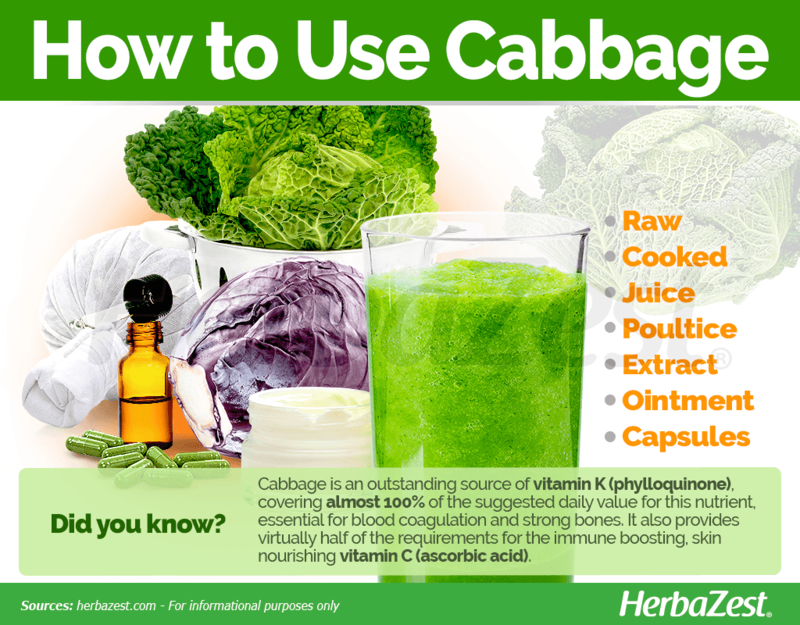 Cabbage is an outstanding source of vitamin K (phylloquinone), covering almost 100% of the suggested daily value for this nutrient, essential for blood coagulation and strong bones. It also provides virtually half of the requirements for the immune boosting, skin nourishing vitamin C (ascorbic acid). 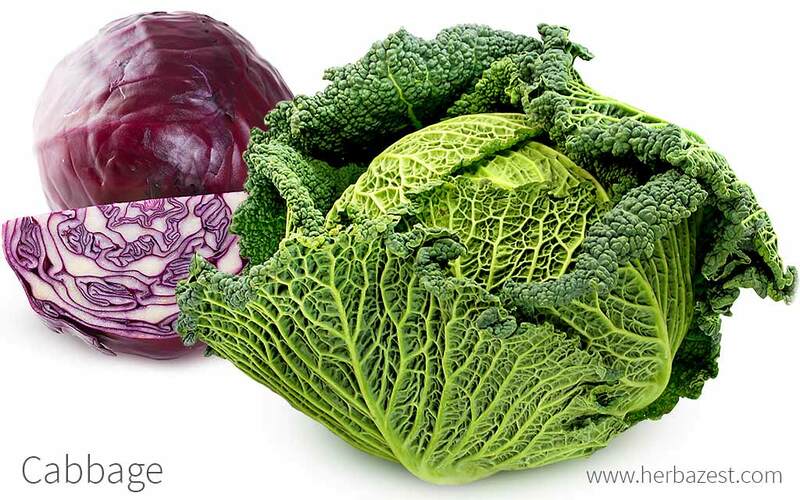 Although green cabbage is eaten more often, red cabbage offers more nutritional benefits. It is rich in beta-carotene, which is converted by the body into vitamin A, necessary for normal growth and development, immune system function, and eye health. Additionally, cabbage provides adequate amounts of many important minerals, mainly manganese, as well as vitamins B9 (folate), B6 (pyridoxine), and B1 (thiamin). Its nutritional value is rounded by smaller quantities of other nutrients, such as calcium, magnesium, potassium, and phosphorus, along with vitamins B3 (niacin), B5 (panthotenic acid), and choline. Those who want to lose weight also benefit from consuming cabbage, as it is considered to be one of the best low-calorie food options. Like other vegetables, such as asparagus, carrot, and spinach, cabbage's antioxidant content increases when it is cooked. 100 grams of raw cabbage provide 25 calories, as well as 10% of the daily value for dietary fiber. Cabbage benefits can be reaped in a variety of ways. The most popular preparations of cabbage include light steaming or raw consumption. Raw cabbage is commonly used in coleslaw and other type of salads, as well as fermented in lactic acid bacteria to make sauerkraut, which is consumed as a natural source of probiotics, beneficial bacteria for the digestive tract. The most consumed parts of the cabbage plant are the compact inner leaves, while the core and outer leaves are generally discarded or sometimes used to feed livestock. Raw. In order to treat the ache and inflammation often caused by breastfeeding, apply fresh, clean, and refrigerated cabbage leaves directly to the breast skin. When the leaf gets warm and wilted, change it for a fresh one. Cooked. Cabbage leaves have traditionally been used in a myriad of culinary recipes. Eating them in stews, soups or steamed can be very beneficial, as their antioxidant capacity increases when cooked. Juice. Drinking a mixture of raw carrot and cucumber juice (80 mL) mixed with raw cabbage juice (40 mL) will make dry hair soft and shiny. Also, vitamins A and D from the juice work together to clear skin. Poultice. Cabbage is effective in clearing skin irritations such as acne, rashes, eczema, psoriasis, and more when used as a poultice. Blend the cabbage leaves, wrap the contents into a cloth, and apply over the affected area for 15 minutes. Extract. Due to its natural antioxidant activity, cabbage extract has been shown to lower blood glucose levels, improve renal function, and aid in weight loss. Ointment. Topical skunk cabbage ointment or salve is thought to stimulate abrasions and ease pain. Cabbage is also sometimes seen as a main ingredient in some facial creams for acne and other skin conditions. Capsules. 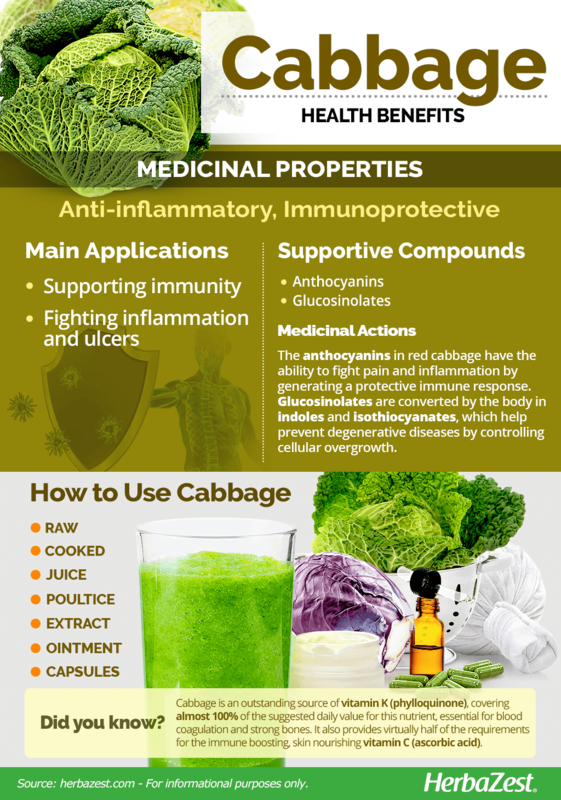 While this use has not been scientifically tested, cabbage capsules are claimed to help out with stomach problems, such as pain and ulcers. In-season cabbages in North America can be purchased in the late fall and winter. Cabbages can be purchased at most grocery stores and supermarkets, as well as farmers' markets. Choose a firm cabbage that is free of bruises and cracks. Keep cabbage fresh in a plastic bag in the refrigerator. Red and green cabbage will keep in the fridge for two weeks, with Savoy cabbage staying fresh for one week. Sauerkraut can be purchased year round at most supermarkets or food stores. Specialty cabbage products, such as extracts and tinctures, can be primarily purchased online. RED AND GREEN CABBAGE WILL KEEP IN THE FRIDGE FOR TWO WEEKS. The cabbage plant can be cultivated as an annual or biennial crop. There are three main types of cabbage: green, red, and Savoy. Each type is distinct from the others. Green cabbages have colors that range from light green to dark green, and red cabbages range from red to purple with white veins. They both have smooth leaves. Savoy cabbages are not as smooth and are yellowish-green in color. Red and green cabbages have a more pronounced taste and texture. Savoy cabbage season peaks in the spring, although this variety is widely available throughout the year. Red cabbage peaks in the fall and green in the winter. However, no matter the variety, it's important to follow particular growing guidelines. Cabbages are cool-season vegetables that grow best when daytime temperatures are around 60°F (15°C). Grow cabbages in well-drained, fertile, sandy loam soil that is high in organic matter. Avoid any type of soil that dries rapidly. Soil pH should be between 6.0 and 7.5. Cabbages can tolerate slightly alkaline soil. Cabbage grows best in full sun. The plant can tolerate light shade, but it will take longer to mature. However, light shade may be helpful in warm weather. Cabbages are heavy feeders that require consistent moisture. Cabbages are propagated by seed. Allow a germination temperature of 45 - 85°F (7 - 29°C). If not planted immediately, seeds can be stored for five years. Cabbage should be planted 12 - 24 inches (30 - 60 cm) apart, at 0.25 - 0.75 inches (1.3 - 2.0 cm) deep, in rows separated by 18 - 34 inches (46 - 86 cm). Some common pests include cabbage aphids, cabbage root maggots, cabbageworms, flue beetles, cutworms, cabbage loopers, slugs, and nematodes. Potential diseases include clubroot, purple blotch, black leg, black rot, and cabbage yellows. Extended information about growing cabbage can be found in the herb garden section. The cabbage is a cruciferous vegetable with a compact head and overlapping leaves. The head, the part of the plant that is consumed, consists of the stem terminal and densely-packed leaves. As the outermost leaves spread and grow, the head is protected throughout the entire growing process. In turn, when ready for consumption, the protecting leaves are not eaten. Cabbage belongs to the Brassica genus and it is a member of the Brassicaceae (formerly Cruciferae) botanical group, also known as the cabbage or mustard family, which comprises about 360 genera and over 3709 species - mostly herbaceous plants -, several of them with great medicinal, nutritional, and economic value, such as arugula, broccoli, cauliflower, and mustard, often called "cruciferous vegetables." There are hundreds of varieties that differ in color, texture, and shape. However, in the United States, the most popular varieties are 'green', 'red', 'Savoy', 'bok choy', and 'Napa'. Some hybrids are resistant to certain diseases and insects. Late varieties grow larger heads and tend to store better or are used to make sauerkraut. Some of the more common late-season cultivars include 'January King', 'Late Flat Dutch', and 'Brunswick'. More common early- and mid-season cultivars include 'Fast Ball', 'Henderson's Charleston Wakefield', and 'Cuor di Bue Grosso'. There are some recommended green and red cabbage hybrids that are resistant to fusarium wilt, a common fungal disease that turns leaves yellow. The green cabbage hybrids include 'Cheers' and 'Early Jersey Wakefield'; red cabbage hybrids include 'Red Meteor' and 'Ruby Ball'. Native to the Mediterranean region that includes parts of Africa, Asia, and Europe, cabbage is one of the oldest vegetables known and has been cultivated for over 4,000 years, with records dating back to in ancient China. It was brought to Europe around 600 BCE by groups of Celtic wanderers. Ancient Greeks and Romans used it medicinally, as well as the Chinese, who prescribed it for treating ailments such as the common cold, constipation, hot flashes, and more. It is said that sauerkraut was used since 200 BCE as a staple food to feed the laborers of the Great Wall of China. 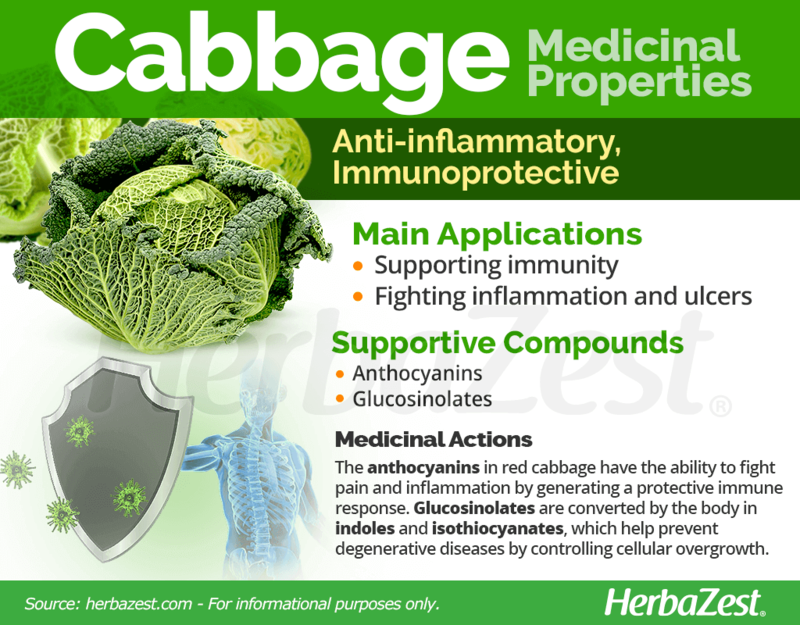 In European folk medicine, cabbage was made into a paste to relieve inflammation. While it's unclear where and when today's headed cabbage was originally developed, cultivation spread across Northern Europe into Germany, Poland, and Russia. Today, Russia, Poland, China, and Japan are the leading producers of the Savoy cabbage. Cabbage is also considered Russia's national food, with Russians eating about seven times as much cabbage as the average North American. Cabbage demand increases in March because of the St. Patrick's Day holiday, which is associated with the traditional corned beef and cabbage meal. The majority of cabbage is used for coleslaw, followed by fresh head lettuce and then sauerkraut. Commercial production in the United States is around 1.3 million tons, of which around 200,000 tons is fermented into sauerkraut. Since the cabbage is considered a cool-weather crop, most production happens in the fall, winter, and spring in the southern part of the United States, with the northern states producing during the summer. New York, Texas, Florida, Georgia, and California cultivate 75% of the cabbage on the market. It is traditionally believed that eating cabbage on New Year's Eve will bring good luck and that the leaves represent prosperity. Cabbage is also used as a pH indicator, due to its content of anthocyanins, which change color depending on the level of acidity of the solutions. In a highly acidic solution, it will become reddish-pink, while a neutral environment turns it purple. An alkaline solution gives it a bluish-green to yellow hue. 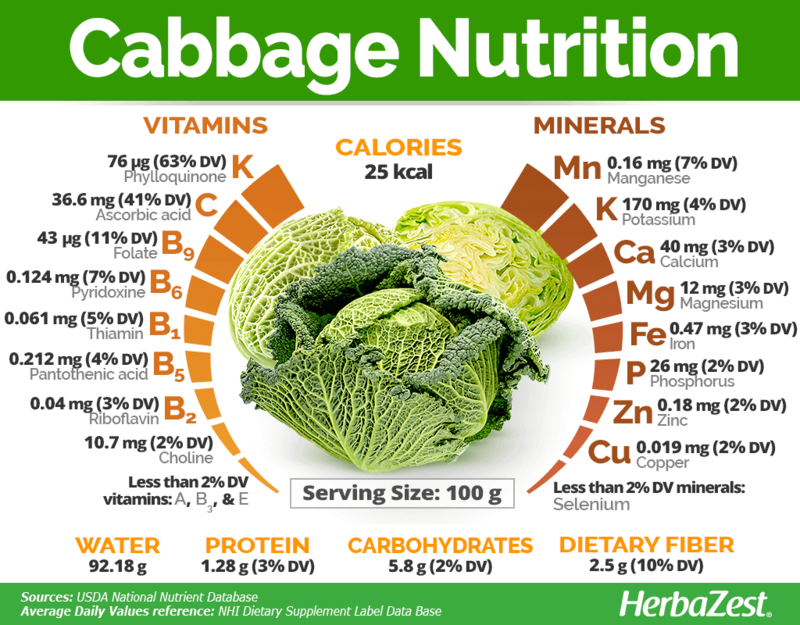 The assortment of vitamins and minerals present within cabbages makes them a healthy addition to a balanced diet. This cruciferous vegetable assists the body in boosting immunity, improving ocular health, and fighting inflammation, among other health benefits that make it worth to try in any meal, whether as a side dish or a main course.